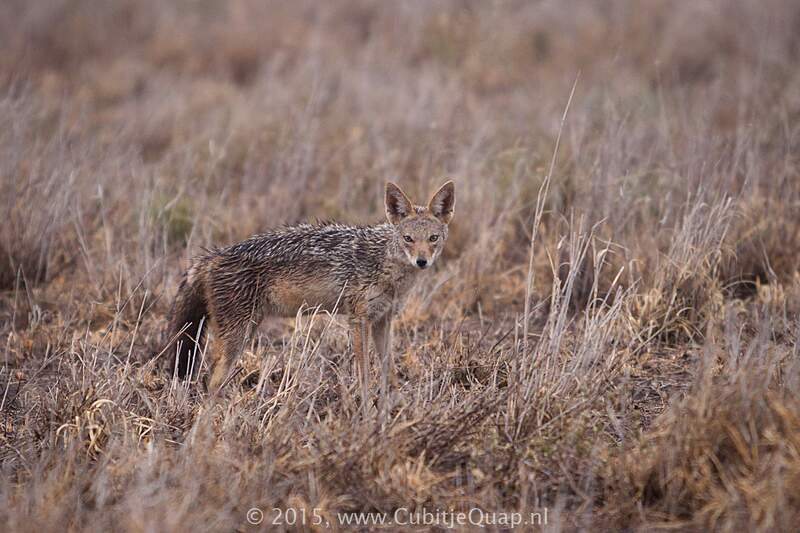 From a distance this jackal has a uniform grey appearance but at close quarters a light coloured band, literally fringed with black, can be seen along each flank. The side-stripes give the jackal its name. The underparts and throat are paler than the upperparts. The tail is quite bushy, mostly black and usually has a white tip. It lacks the typical silver mottled sadle of the black-backed jackal. It shows a preference for well-watered wooded areas, but not forest. Although it is mainly nocturnal it may be seen in the early morning and late afternoon. Most sightings are of single animals, although pairs and family parties are often encountered. Call has been likened to owl hoot, quite unlike long, drawn-out howl of the black-backed jackal. It is an omnivorous species taking a wide variety of food items from small mammals, birds, reptiles, insects and carrion to wild fruits.